Driving through the Greenwood neighborhood yesterday afternoon, I was actually heading for my favorite traffic circle to see if our recent heavy rain had taken down the maple leaves. But I never made it that far, because I took a turn onto a street I don’t usually take – and stopped dead in my tracks. 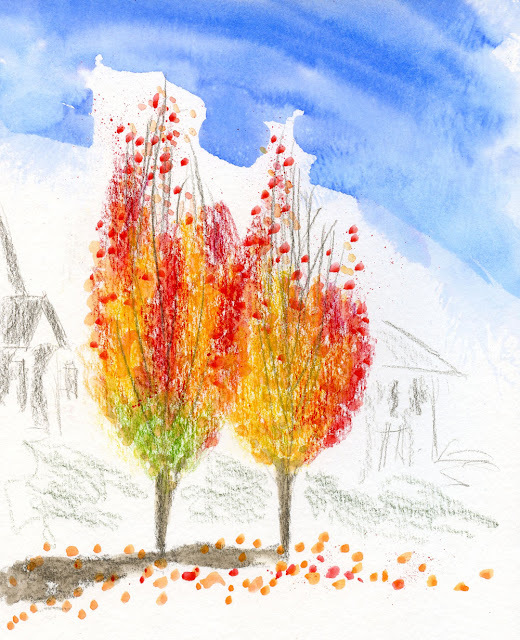 Though mostly bald on top, these two maples still blazed with color, going out with a big bang. A similar sidetracking happened today, when I was walking across the University of Washington campus. I was on my way to the Quad, which is one of my favorite places to sketch during cherry blossom season. (It turned out the cherries were disappointing – mostly green but turning straight to brown instead of yellow and orange first.) On my way back to the car, I passed Paccar Hall, where a yellow tree (wish I knew what kind it is) was afire in the high sun. 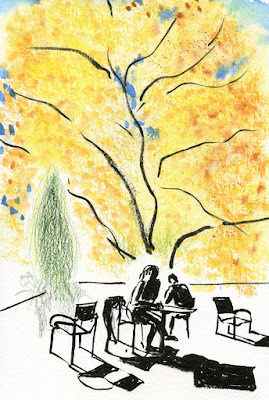 I went up to Paccar’s third floor terrace to sketch it. We are having the most amazing autumn this year, aren't we?